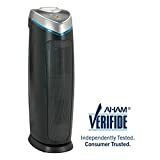 People suffering various health related issues like allergies, asthma and similar, require good vacuum cleaners with proper, true HEPA grade, air filtration, but they can significantly benefit by using air purifiers – standalone devices that silently, but efficiently, clean air from small particles like dust, pollen, pet dander, mold spores and other airborne pollutants. Air purifiers come in various sizes and types and before even considering buying them, one must know what to actually look for. – Room or area coverage describe recommended maximum size of the room where air purifier can efficiently do its job, and is given in square feet or square meters. If the room is regularly cleaned with HEPA grade vacuum cleaner, and there are no large influx of external particles, actual room area can be even slightly larger than recommended by manufacturer. However, if you have pets and kids and they often play outside, be sure to follow recommendations by manufacturer of the device. – Air Flow of the air purifier defines amount of the air which can be processed by the device. This measure is given in the cubic feet per minute (CFM) or in cubic meters per. Most home units have several speeds which usually range from 100 to 500 (or even more) CFM. Note that larger air flow requires larger pressure drop on the filters and hence, require more energy and produces more noise. 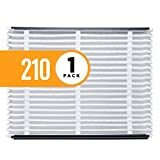 For example, if maximum air flow of the air purifier is 400 CFM and it is positioned in the 500 ft room (20 x 25 ft) and ceiling is 9 ft high, volume of the room is 4500 CFM – such air purifier can clean entire room in less than 12 minutes. Personally, I would consider quiet air purifier even with lower CADR rating (Clean Air Delivery Rate, given in CFM) for room of that size – low noise air purifiers operate 24/7 and rarely ‘must’ operate in such ‘panic’ mode. 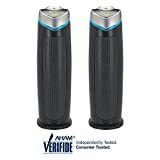 – Air purifiers often come with very lengthy warranties – often 10 years or even more. However, one must be very careful and read warranty conditions – for example, models made for US market operate at 110/120V, 60 Hz and if used abroad, even with electric converters, warranty can be lost. Long story short – read the manual and warranty conditions, just to be sure. – mechanical pre-filters – these filters are simple, washable filters which trap larger particles and extend the life of the inner filters. – charcoal filters remove pollutants on the molecular level, they are very efficient and they remove pet odors, dangerous gases and similar. 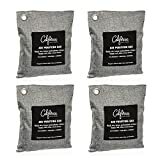 However, charcoal filters must be replaced from time to time. 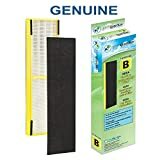 – HEPA grade filters come in various classifications, but standard US definition of HEPA air filter (often called ‘True HEPA’) is: HEPA filters can remove at least 99.97% of particles 0.3 micrometer in size. There are NO 98% HEPA filters or anything similar – such claims are just marketing tricks. Some HEPA filters are washable, some are not. Some manufacturers combine HEPA mechanical filters with ion technology. – sand 50.0-1000.0 micrometers, etc. For more about HEPA filters and HEPA filtration, feel free to check Exhaust Filtration – HEPA Vacuum Cleaners article. – ionic air purifiers use locally generated ions to remove even the smallest air particles from the air flow. 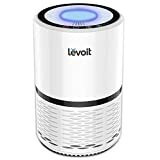 They are often combined with UV lamps which disinfect (plain and simple – kill) germs, viruses, bacteria, and other microorganisms that cause asthma, allergies and other health issues. UV lamps are important for one other reason, too – filters are changed every few months or even years, so it is important to keep them sterile. Otherwise, buildup of bacteria in the filters could potentially lead to new problems. Ionic purifiers produce small amount of ozone, which helps to keep filters bacteria-free, but the amount of ozone in exhaust air is kept very low, below safe limit, since ozone can be very harmful, if present in larger amounts. There are other filter technologies used in modern air purifiers: titanium dioxide (TiO2) is used to remove, among others, acidic gases from the air; thermodynamic air purifiers use very hot plate(s) with micro-tubes to sterilize the air using heat (air is cooled before being released), etc. Note that some of these technologies is used to sterilize the air, not to remove the particles from the air and thus must be combined with HEPA and/or charcoal filters. – dimensions – desk air purifiers can be rather small and can fit on the most office desks. Larger purifiers are standalone units which can be transported from room to room, if required, or can be positioned on permanent location. Wall mounted air purifiers operate on permanent location. Read the manual and warranty conditions, place the filters, turn the unit on and forget it, until onboard computer warns you that it is time to clean or change the filter(s). Seriously, they are that simple. And the best of all, they often look rather stylish and decorative. Air purifiers – are they really necessary? Number of people suffering from allergies, asthma and similar problems is increasing year after year. Amount of pollutants in the air is also increasing year after year. So, long story short – if you do have such problems or want to limit exposure to pollutants in your environment (second-hand tobacco smoke, for example), good air purifier can be of great help in order to improve quality of life.